North Korea's Sohae long-range rocket site is now back to "normal operating status," according to new commercial images and analysis provided by CSIS, as NBC News reports. Dive Deeper: “Sohae Launch Facility Update: North Korean ‘Snapback’ After Hanoi,” by CSIS’s Joseph Bermudez and Victor Cha. Dive Deeper: “Taking Managed Trade Seriously—What Would a Deal that Tries to Close the Bilateral Deficit Need to Look Like?” by CFR’s Brad Setser. Check out CSIS’s new series of video shorts: “Testify” and “High Resolution.” In under 90 seconds, CSIS experts tell you what they told Congress in testimony, or use high-resolution satellite images and advanced mapping to break down national security issues. And don’t forget to subscribe to the CSIS YouTube Channel! The House today overwhelmingly approved a far-reaching resolution condemning anti-Semitism and bigotry by a margin of 407-23. "Reduction of the physical caliphate is a monumental military accomplishment but the fight against ISIS and violent extremism is far from over." Does the U.S. withdrawal from Syria spell conflict between the Kurds and Turkey, or can more bloodshed be avoided? 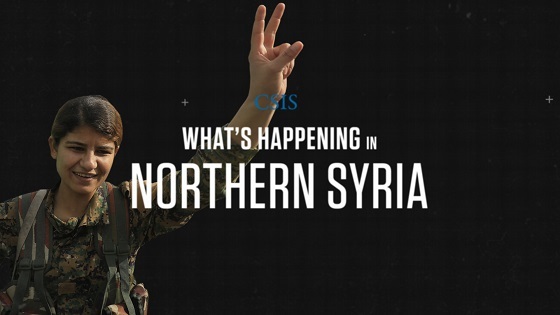 In this short video, CSIS’s Turkey Project director Bulent Aliriza explores the complex web of actors in Northern Syria. Watch it here. 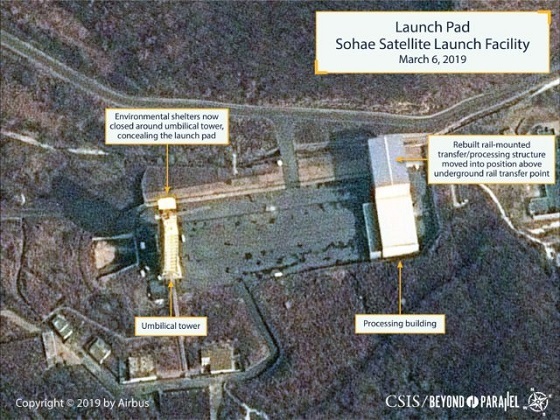 New satellite imagery acquired by CSIS on March 6 shows that North Korea has essentially completed the rebuilding of both the rail-mounted transfer/processing structure on the launch pad and the vertical engine at the Sohae Launch Facility. “What Italy Stands to Gain by Endorsing China’s Belt and Road,” by the FT’s James Kynge. At 10:00 a.m., the United States Institute of Peace will host UK Secretary of State Penny Mordaunt to hear her views on empowering women and girls in fragile and conflict affected states. Later, at 11:45 a.m., the Hudson Institute will hold a panel discussion on the crisis in Venezuela, the Trump administration’s recent policy responses, and the future of the Latin America. And, at 12:15 p.m., the Atlantic Council will host British National Security Adviser Mark Sedwill to discuss opportunities for the United Kingdom and the transatlantic relationship beyond Brexit. CSIS today hosted a panel to assess the outcome of the U.S.-North Korea, featuring a keynote address from Senator Cory Gardner (R-CO). Watch the full event here. Take as Directed highlights important news, events, issues, and perspectives in global health policy. In this episode, Sara Allinder speaks with Dr. Robert Mwadime, chief of party of the USAID Integrated Community Agriculture and Nutrition Activity in Uganda. Listen on SoundCloud and Apple Podcasts. I’m glad you all enjoyed the Cassandra Wilson version of Son House’s “Death Letter” for the True Detective Season 3 theme song. But how do you like the original?